Server administration can usually be provided by the hosting company as an add-on service. 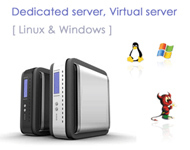 In some cases a dedicated server can offer less overhead and a larger return on investment. Dedicated servers are most often housed in data centers, similar to collocation facilities, providing redundant power sources and HVAC systems. In contrast to collocation, the server hardware is owned by the provider and in some cases they will provide support for your operating system or applications.